An early digital model, animated and integrated into a diagram that acts as a metaphoric project. In the video "Möbius House", the project by UNStudio is explored through the visualization of the diagram on which the entire design is based. 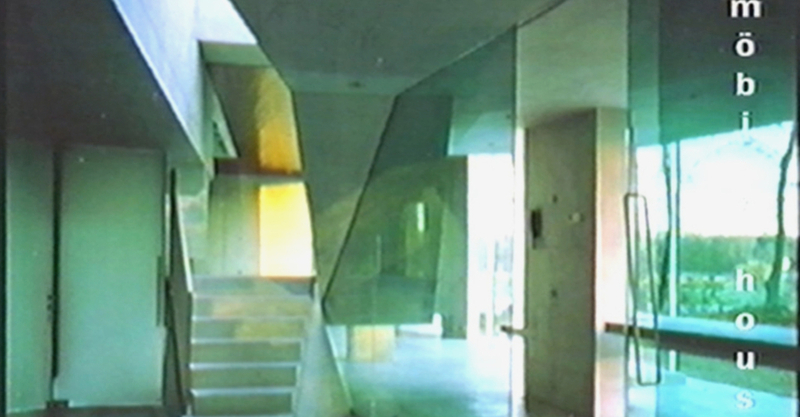 The video - produced by UNStudio as the house was completed in 1998 - presents the integration of an animated early digital model and a diagram during the planning process of the private house, which has itself become an icon. The program and formal structure of the house - located in Het Gooi (the Netherlands) - is shaped by the double-locked torus of the möbius loop. The video shows how the intertwining trajectory of the loop relates to the 24-hour living and working cycle of a typical family life. UNStudio uses the diagram as a means to get back to an exploration of the architectural space in relation to its use and design program, as well as to "liberate architecture from interpretation and signification". A walkthrough animation in the scale model, diagrammatic animations and overlapped photographs introduce the materialization of the building. The combination of different media within the video provide a virtual understanding of the three-dimensional space during the design phase. In the short film, released in a very peculiar moment for the exploration of digital media in architecture, UNStudio has a clear interest in video as both a versatile tool for communication and the better way to "experiencing a building on many different levels from a distance".